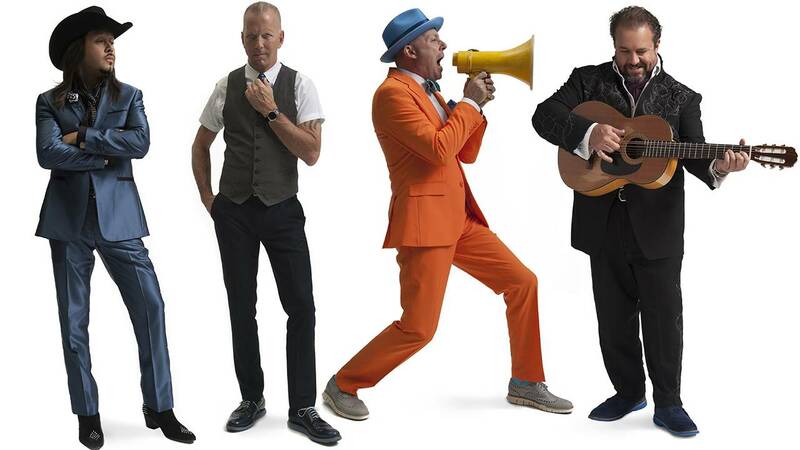 With its latest album, The Mavericks "have got their feet beneath them again." That's the view of guitarist Eddie Perez, who joined the band in 2003, shortly before a decade-long hiatus that might have been the end of the eclectic country-rock band. "We all feel like kids in the garage again," Perez said in a candid interview Monday. "It's very dramatic when you break up and don't make music again. I can say that now and look back with a smile on my face, and I'm grateful because I get to make this music again." The band released its second post-breakup album, Mono, in 2015 and is prepping for two more upcoming releases, Perez said. Their busy tour schedule will bring them to the Panhandle on Saturday as one of the headliners of the Canadian River Music Festival. The festival, now in its seventh year, has an all-star line-up of country and rock acts. In addition to The Mavericks at 7:30 p.m., the two stagees will include Pampa-based rock band City Will Shake at noon, Americana band Shane Smith & The Saints at 1:30 p.m., folk-rock trio The Ballroom Thieves at 3 p.m., Americana singer Bonnie Bishop at 4:30 p.m., and Texas country favorites Charlie Robison at 6 p.m. and The Randy Rogers Band at 9:30 p.m.
Tickets are $25, plus fees, in advance at the festival's website and $35 at the gate (cash only). Gates open at 11:30 a.m. at Jones Pavilion, 1101 N. Sixth St. Food and non-alcoholic drinks will be sold, and coolers are allowed without glass containers. Perez said Mono shows the band's "tremendous growth" since its founding in 1989 by singer Raul Malo, drummer Paul Deakin and since-departed members Robert Reynolds and Ben Peeler. "I think so many thing have changed about what we do and how we do it, and that does reflect in the music," Perez said. "It's very brave and very alive and very pointedly intentioned to what we're doing musically. We are trying to say something, trying to express how we feel in this business." Though the band is feeling creatively inspired these days, that wasn't the case back in 2003-04, around the time Perez originally signed on. "The business can wear you down and it can really have you hating the thing that you once loved to do," Perez said. "Raul had felt that, musically, he couldn't give anything that has any real artistic value. "The way the band has worked, we thrive off his creative link. 'El Maestro' is what I like to call him, and when El Maestro is not inspired, he's not inspired," Perez said. "Creatively, there was no focus because there was no real, in my opinion, inspiration to bear down and give what it takes to put some kind of cohesive art piece together." It wasn't just creative exhaustion, though. The band has been open about Reynolds' opiate addiction leading to his being dismissed from the band in 2014. "The bigger something gets, the more chance you have for it to be corrupted in some kind of way," Perez said. "The easier it becomes for you to lose yourself along the way. ... Too much of a good thing can be too much of a good thing. "I think Robert is doing what he thinks he needs to do. ... I feel sadness for him that he can't be with us to enjoy this part of the ride," Perez said. "We all wish him well. We all view him as a brother. The door is always open." Soon, the band will release a live double album compiled from shows on last year's "whirlwind of a tour," Perez said. "I believe it (will be) a very special record. I feel like we're bringing people into the building and going a step further and putting them on the front row of our live show," Perez said. Shortly after that, Perez said fans should expect a new studio album as well. "It's very forward-moving," Perez said. "We're really on our game right now. I guess that's why I'm so proud."